Although incorporating chalkboard accessories and painted walls into the home is nothing new, I've been noticing chalkboard decor more and more lately, especially with accessories and furniture. 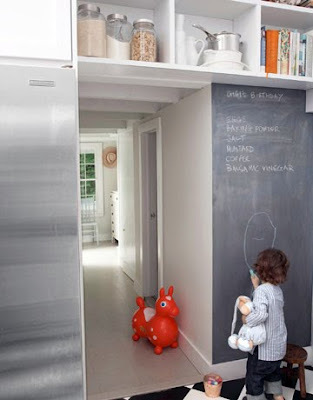 How great would it be to have a giant wall to scribble notes and reminders on in the kitchen?! 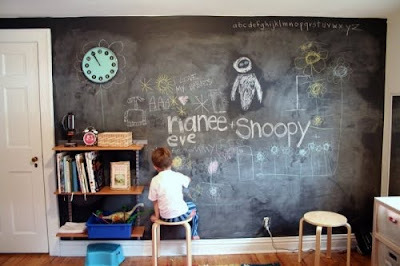 And how much would your kids love to draw all over the wall without getting in trouble? :) I've rounded up some fun ideas on how to incorporate this trend into the home as well as new accessories you can write all over! Back of a bookcase - love this idea! 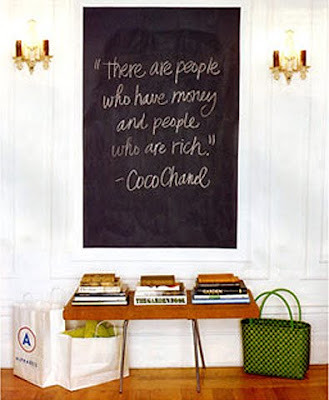 A chalkboard actually works perfectly in this simple yet sophisticated hallway. On the back of the pantry door...very clever. All of the above: New from Paper Source! 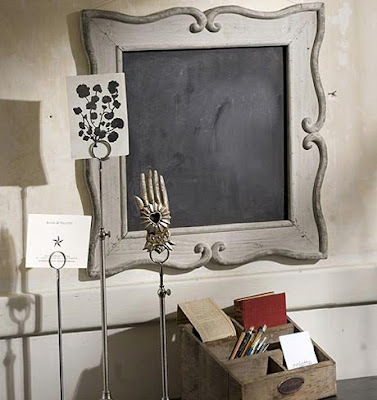 RoCoco Chalkboard Wall Sticker (looks fantastic against the bold painted wall). Framed board - chic and functional! 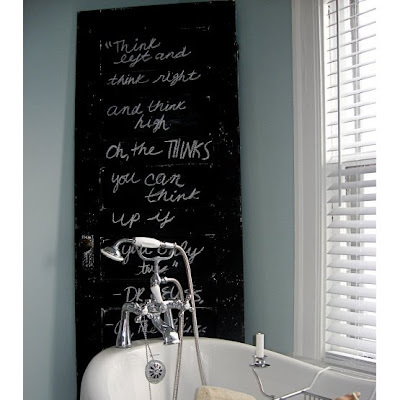 Clever idea for bath decor - lean a simple blackboard in the corner and scribble favorite quotes, etc. 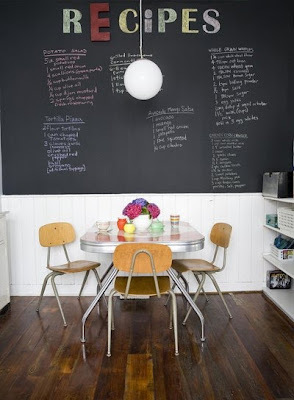 I have always wanted a chalk board in the kitchen! I truly love all of these ideas... This past weekend I painted the outside of my daughter's closet door with the chalkboard paint. She adores it.. We can use it for chore charts, reminders, or simply for playing school.. I highly recommend this for anyone with children! And this weekend I will be painting my pantry door! 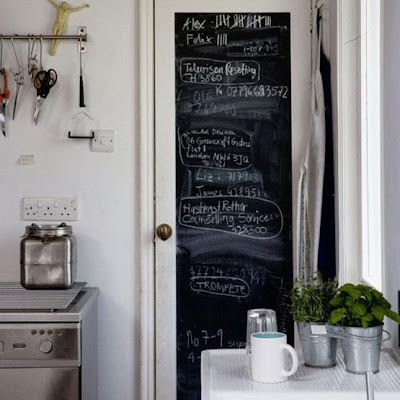 I love the idea of a chalkboard in a kitchen ~ so much nicer to write down things you need from the store instead of sticking a piece of paper under a magent on your fridge or that evening's dinner menu so you don't get asked 3x "what's for dinner?". I did my own DIY chalk board in my kitchen by painting some mdf, I LOVE IT. It is perfect for dinner schedules for the week and shopping lists, well and love notes to the BF. I never would have thought to do the inside of the cabinets though! 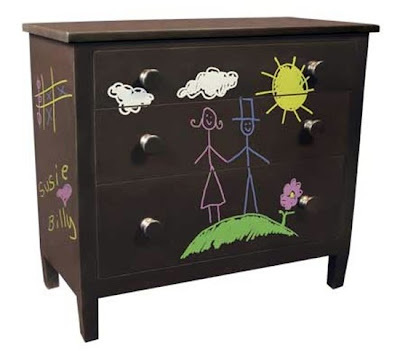 how fun...wouldn't you be tempted to doodle here and there. nice way to unwind and let off steam, just doodle whenever you'd like :) we framed a large rectangle chalkboard painted wall with a beautiful gold frame at our last shop, we sold organic coffee to go there so we'd put prices etc. so easy and cheap! 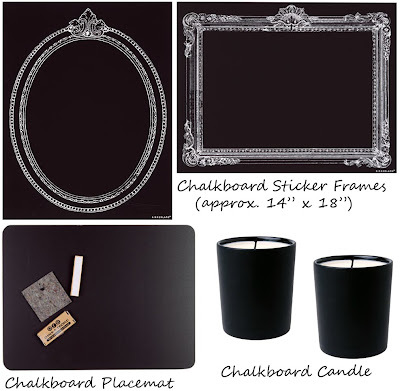 LOVE the Rococo chalkboard wall decal - definitely putting that in a client's baby's room! Thanks for this post. Have you seen 500 Days of Summer? Tom decorates his apartment using chalk and it looks amazing! Great idea. I have a cheap cabinet in my bathroom that had see through glass in the door (not great when you are storing shampoos, medications, etc), so I took the door off, taped it up and spray painted it with chalkboard paint. Now I have privacy and I can write cute sayings on it! 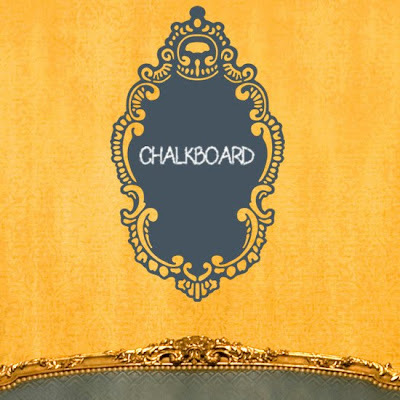 Chalkboard paint is soooo fun! Thanks for a post with other ideas, now I have to figure out what to do with the rest of the paint! Wow I LOVE this... I currently have a chalk board wall in my kitchen floor to ceiling. It's a great convo piece and is very useful.